Facebook has agreed to pay $20 million into a fund in response to a class action lawsuit filed against the social media giant. 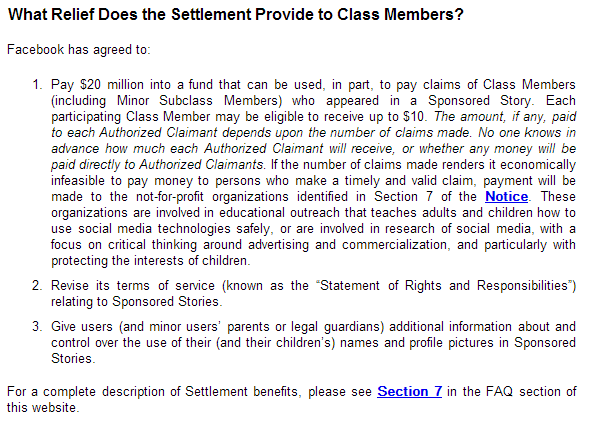 If you are a class member on Facebook (meaning, if a Facebook sponsored story had your name or your picture) then you may be entitled to receive a payment of $10. This settlement was done by Facebook as it used class member's name, profile pics, likeness to advertise its own products or services without taking any consent from the class members. If you have received a message from Facebook with the subject "“Re: LEGAL NOTICE OF SETTLEMENT OF CLASS ACTION.” then you are probably a class member and this gives you the power to receive the money from Facebook.